Now, more than two months after the scandal, Merkel finally turned her attention to the beleaguered city in what even the local mayor, Barbara Ludwig, called a belated gesture. The chancellor met with a youth basketball team, talked to Ludwig and the head of the region of Saxony, where Chemnitz is located. In an apparent attempt to heal the rift between the government and the people, she also engaged in what she called a “civil dialogue” with some 120 readers of a local newspaper. The chancellor’s visit predictably brought no surprises as she kept defending her immigration policies, admitting, however, that they provoked some “dissatisfaction” among Germans. She described the Chemnitz murder as a “horrifying crime” but said that no crimes justify other crimes, referring to the far-right violence and xenophobic attacks. “What concerns me is the fact that, as a result of these developments [in Chemnitz], many people have lost the feeling of security,” she told the audience, adding that restoring this feeling is a responsibility which “a state governed by the rule of law” should bear. However, she then immediately said that the feeling of insecurity is mostly “subjective” and is not supported by statistics and police data. Claiming that her government made just one mistake in its immigration policy, she explained it “was made not when the refugees were coming” in Germany, but rather when it failed to care enough about the people fleeing wars in Syria and Iraq for refugee camps in Jordan and Turkey, before the refugee crisis actually reached Europe. However, whether she indeed managed to strike a chord with the locals remains unclear, as twenty times more people than the number that went to greet her opted instead to attend a protest against her visit. 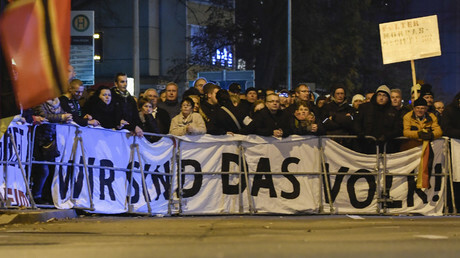 Some 2,500 people took to the streets of Chemnitz on Friday to express their discontent with the chancellor’s policies. The protest was organized by the anti-immigration Pegida movement as well as a local far-right Pro-Chemnitz group, according to German media. A group of protesters also designated themselves a ‘Merkeljugend’ in an apparent reference to a Third Reich Nazi youth movement called ‘Hitlerjugend’. Die Rechten wollen Merkel lächerlich machen, in dem sie sie mit Hitler gleichsetzen. Müssten die Rechten nicht gerade dann glücklich sein? The protesters argued that Germany has turned into a sort of dictatorship under Merkel, while comparing her government’s polices with those of Communist East Germany’s secret police – the Stasi. Merkel herself also appeared to be not ready for dialogue with those, whom she branded as far-right populists.